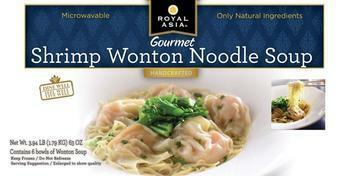 Tai Foong USA of Seattle, Wash., is recalling Royal Asia Shrimp Wonton Noodle Soup. One allergic reaction complaint has been confirmed to date. The recalled product, Royal Asia Shrimp Wonton Noodle Soup; net weight 3.94-lb (1.79kg) 63-oz in a 6-bowl pack, was sold exclusively at Costco in Washington, Oregon, Montana, Idaho, Utah and Alaska beginning January 2017. Customers with an allergy concern who purchased the recalled product should return it to the store where purchased to request a full refund. Consumers with questions may call 800-388-3666 #200 or visit www.northernchef.com.